Coach has launched Coach Signature Summer, this year's limited edition summer version of 2007′s Coach The Fragrance (now known as Coach Signature). Last year's model was Coach Signature Summer Legacy. Coach Signature Summer Limited Edition is an effortlessly chic fragrance that features key notes of Water Lily, White Peony and Vanilla Orchid. It's the ideal every-day accessory, and a must have this summer! 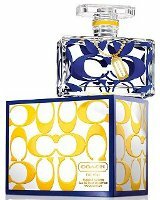 Coach Signature Summer Legacy can be found now at Macy's or Ulta, in 50 ml Eau de Toilette, $68. Does anybody like any Coach of any kind? I think I have tried a Coach or two, but if so have utterly blanked out on them. Really liked the Coach Leatherwear collection for men. Otherwise, no.